It took me 3 years to write my first book. It presents my whole philosophy of personal development and describes my own original Insight method - the road to attaining mental and emotional maturity. What is mental maturity? It’s a state of deep mental balance, healthy self-support system, and freedom from the self-destructive habits of your mind. Working with this book is a fascinating journey to the inner self, which goal is the insight, self-knowledge and self-relying implementation of your own solutions to your mental conundrums. "You won’t read Michał Pasterski’s book from cover to cover in just one day. The author exacts focus and encourages self-reflection. The set of carefully selected exercises motivates you to ask questions and look for answers. Another advantage of the book is, for sure, its practical approach. Having read the book, you will find attached a 30-day plan, which will help you consolidate the Insight method and enhance the effects. " "Pasterski goes against trend - he does not offer easy solutions like changing your life in 21 days. Neither does he guarantee that after you read his book, you will become a slim, beautiful millionaire whose success will make everyone jealous. Instead, he offers some sort of manual for personal work. And such work requires time and commitment (...) This book is a fascinating source of knowledge and serves as a wonderful self-development tool for working on your convictions, behaviours and attitudes." "The biggest advantage of the book is Michal’s remarkable ease in conveying intricate concepts, as well as his skill of storytelling, which he marvellously uses to illustrate the issues he describes. It was a good read. Simple language, interesting stories, lots of exercises. Book definitely for people interested in their inner world. I think that this volume will be of great value for both a psychology student and an absolute beginner, whose fascination with the human psyche is just waking up." "I think this book is perfect not only for the people who would like to work on themselves, change something in themselves, and finally find inner peace. It is also a volume that a psychologist, a personal trainer and a coach should read. After all, it's a very demanding book, as the author himself suggests, it's good to make notes, underline the important parts, and most importantly, do the exercises that are presented in the book." 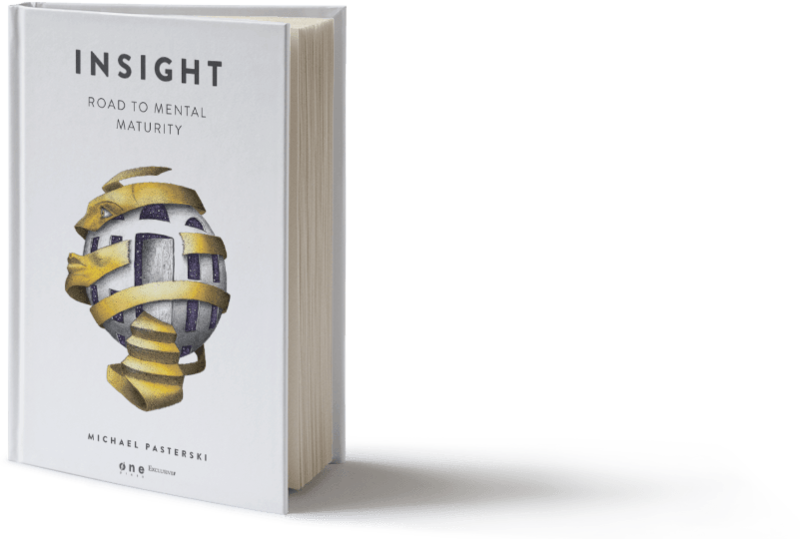 "The biggest asset of the Insight book for me is a set of around 40 exercises and experiences proposed by Michal Pasterski, some of them his own original ideas, some inspired by the already existing techniques. They take just several minutes to go through them and you can do it many times. They seem very effective in consolidating the information provided in the main text and putting theory into the practice of inner life." Look inside the book and order a printed version or ebook.